developing tailored nanostructures and materials, and analyzing the chemical structure of matter with cutting-edge electron microscopes, they are running an artists residence in collaboration with GNRation – a hub for creativity devoted to the promotion and dissemination of digital arts, to nurture the exciting dialogue between art and science. Project name is Scale Travels, and it aims at producing new artworks building on very last developments in the lab’s research. 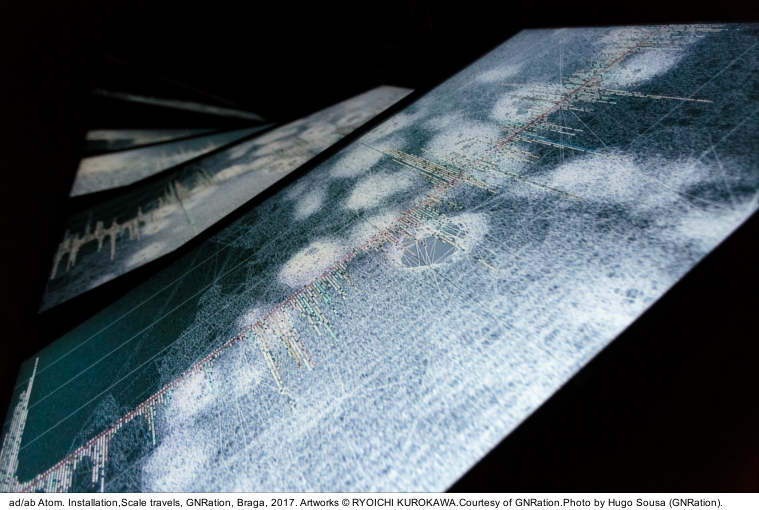 Japanese pioneering audio-visual artist and scale travel professional Ryoichi Kurokawa was the last protagonist of the program by creating an artwork to make people feel what does it mean to experience nature at an atomic scale. ad/ab Atom takes its name from the Latin prefixs ad-ab (meaning “to/toward” – “away from”) and it is the recombinant of the neologism “adatom/abatom” in particular, where the law governing the nature blurs. The work consists in an 8 minutes loop 7ch/5ch display and 4ch multi-sound “sculptural-style electroscopic installation” – as defined by Kurokawa himself – that turns data and scientific materials coming from the Department of Quantum Materials, Science and Technology/QuantaLab at INL into an audiovisual hypnotic phenomenon. 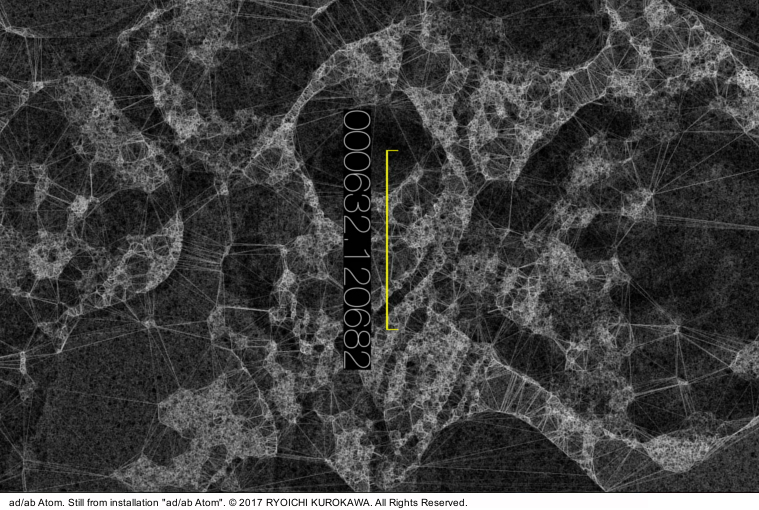 Between all the advanced technologies used in there, Kurokawa has taken into account mostly visual data by electron microscopy scanned probe and computational ones, and also mathematical modelling, by analyzing, distorting, deconstructing and reconstructing them on the surface of his spin-structured HD screens. Master of immersive synesthetic universes – where images should be perceived as sounds and sounds as architectural structures, Kurokawa is keeping challenging human senses spectrum by means of cutting-edge visual technologies and computer-generated structures. More recently he has been talked about as the one who unfolded the universe with unfold, the outcome of another inspired artist-scientist collaboration, this time with the CEA Irfu astrophysics Vincent Minier. Combining data from molecular clouds in space and audiovisual technology this body of work addresses issues as the birth and evolutions of stars and solar system. After these two intense experiences he kindly accepted to answer to my questions and in less than no time, we have found ourselves talking about the infinitely small, the magic of nature and the delicate balance between art and technology. Federica Fontana: You always say that nature plays a fundamental role in your work, and if I think about your last releases we could say you went from the unfold “feel the universe” to the present “feel the atom”. Do you consider nanoscience and collaboration with INL as a way to reconnect with nature on a different – atomic scale? Ryoichi Kurokawa: I mostly conceive an idea of artwork from nature. And natural law-physics is also an important element and becomes a trigger for my works. I’m feeling like treating physical law at the same level as treating nature itself. Although the laws of nature are governed by quantum mechanics for this time, I worked in the same way as treating other fields in physics data or natural phenomena. The theme of unfold was on stellar formation, so for ad/ab Atom the scale is opposite. It was a great opportunity to treat both micro and macro scientific materials to create different works. Federica Fontana: In a video interview for GNRation you said that ad/ab Atom is not intended to explain nanoscience but would rather work as an introduction for the public to it. What kind of contribution do you think your works – again I’m thinking about unfold– could provide to the science? And, on the opposite: what does interfacing with science could add to your audiovisual research? What is your purpose by creating this kind of connections? Ryoichi Kurokawa: What I’m doing is remaining within the field of art, not in science nor in art-science like as a new discipline. To create an artwork, I’m applying scientific materials and working with scientists. 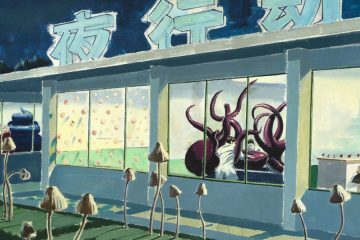 Additionally, I’m distorting scientific sources, so I don’t think my artworks could provide something to science directly, I consider them more as a gateway for the public. 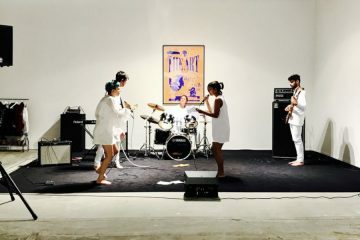 In general, not only for these pieces, I used scientific information, I’m thinking that it would be great if my pieces could let viewers think through its experience or could be a trigger for them to act something. Some scientists take an interest in these artistic renderings, it’s beautiful if these pieces could provide a different perspective to scientists also. Federica Fontana: Both last two works of yours brought you to address and relate to different science field, in ad/ab Atom is nanoscience whereas in unfold was astrophysics… Should we consider these science-based collaborations as a new direction of your research? Ryoichi Kurokawa: I don’t consider it as my new direction but I’ll continue to work with different fields of science as working with scientists is very inspiring. 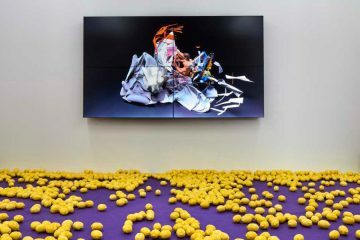 Federica Fontana: Like Oscillating continuum and Constrained Surface, ad/ab Atom installation is revolving around an unusual monitor disposition, a twisted one in particular. This of panels orientation is an aspect you particularly care, what is the effect you aim to achieve? Ryoichi Kurokawa: For display design, I’m trying to liberate conventional ways and find new possibilities within the boundaries of a frame and its effects on the exterior of the frame. I don’t reject convention, I’m just setting out alternatives instead. Each piece has its own structural concept and owns an effective design according to its visual content, and for ad/ab Atom, I’ve introduced the structure of vector field which is spin-effected. Federica Fontana: You stated that you are not intended to make an art about technology, but technology is just a medium. In your experience which is the point in which technology overcomes the work? How could one avoid it? 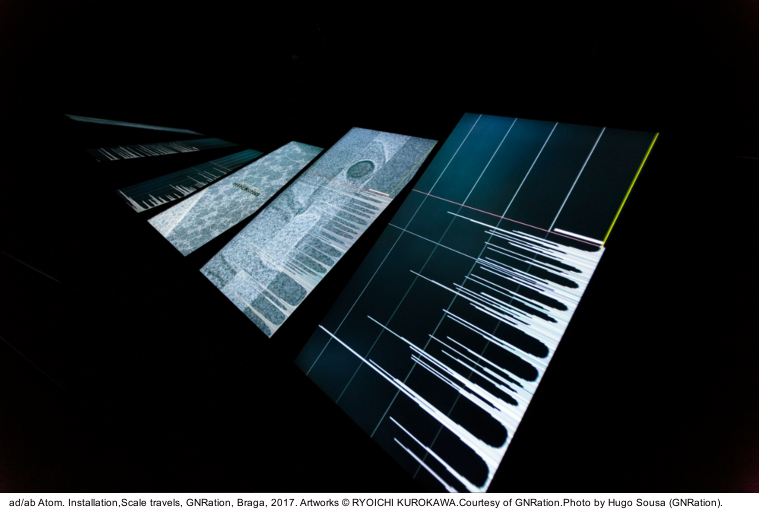 Ryoichi Kurokawa: Technology extends not only the creation but also perception of art, it provides many possibilities in the art field. Technology is playing a very important role in my works, but I’m considering them as tools for my art pieces. I’m always trying to avoid just demonstrating the technology, trying to prevent producing superficial work which just gives an impact by the use of technology. Federica Fontana: With unfold you dealt with two different types of scientific data – the same as scientists do, and you intended to destroy/deconstruct them. Does ad/ab Atom respond to the same need? Ryoichi Kurokawa: Though the scale is opposite, working method and process are quite the same. Scientists at INL are working with computer languages such as Python/Fortran for scientific computing and mathematical modelling, and I’ve exported useful data of their codes and bring them to my work environment, different languages like C++ for example. This working method is similar to the creation process of unfold with CEA,Paris-Saclay. 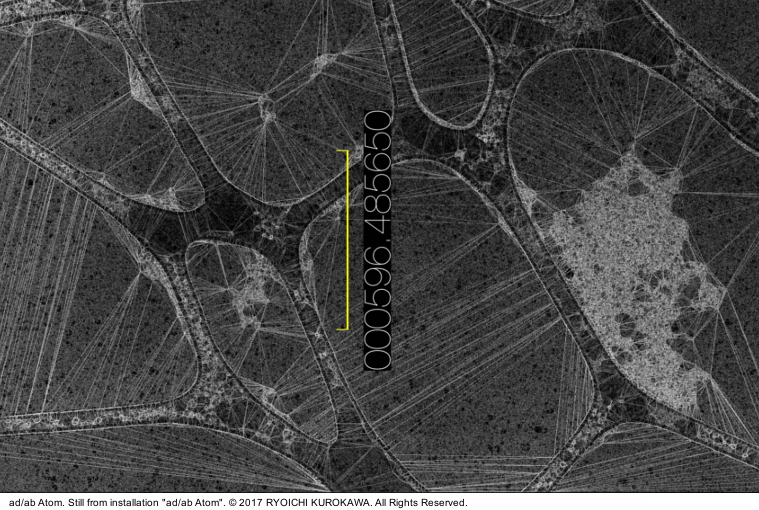 Also for ad/ab Atom, I used a lot of observed image data detected by electron microscopy or scanned probe. So the available scientific material types are the same in a way. Those sources were analysed, filtered and distorted into artistic renderings. Next time, it might be interesting to focus on treating only materials of theoretical physics or experimental, not from both. 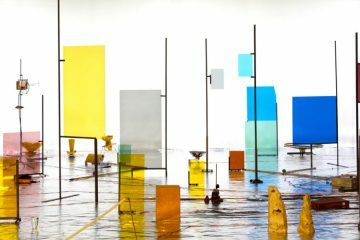 Federica Fontana: Large scale –small scale: your work constantly goes back and forth between these two dimensions, is there one format that is more challenging for you? Does switch come naturally according to the space? 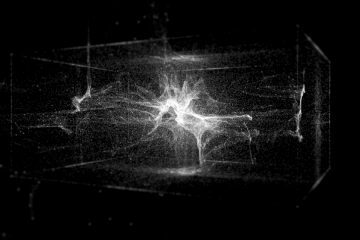 Ryoichi Kurokawa: There is no any such specific format, each scale and space has his own features. I can design more straightforwardly the piece structure for the case of commissioned works as I could know the space details in advance. But basically I set specific space scale at first, and then start designing work by considering it as a certain amount of size-scalable piece. Federica Fontana: Tell us about the sound in your new installation. 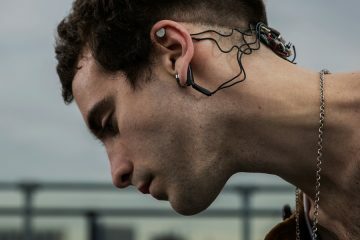 You are used to working with computer-generated structures but in this case they’re already given: how did sonification process work on in this case? Ryoichi Kurokawa: For the sound of ad/ab Atom, I didn’t use any sonification, I simply composed it arbitrarily with the sound materials purely generated by computer in isolation from data, by focusing using scientific sources for all visual components. Federica Fontana: Basically, in their work nanoscientists are dealing with making visible something that naturally is not; like them, you are trying to go beyond physical limits of perception and to make perceivable the unperceivable. In some sense, this seems to be the main link between your practice and scientists one, what do you think? 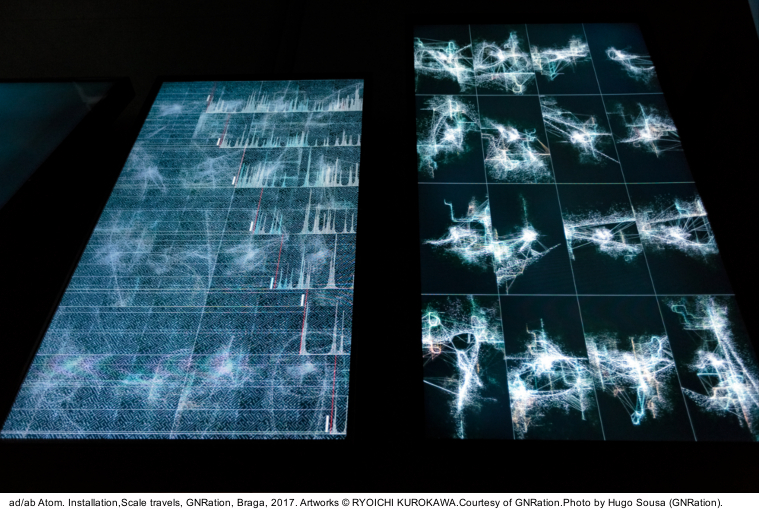 Ryoichi Kurokawa: My working method is not always like this, but in some cases, the action might be similar but its vectors and effects are different.